For their fifth release, Lex Metalis (latin: metal is law [sic]) Albuquerque metal stalwarts Ultimatum raise their collective horns to their peers from the past. Singer Scott Water (webmaster for nolifetilmetal.com) and company make no bones about loving all things 80's metal. Their tribute includes songs from Metal Church, Judas Priest, Motorhead, Saxon, Metallica, well you get the idea. 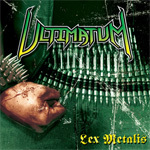 Generally, Ultimatum pulls every song off with the energy and passion of true believers that makes Lex Metalis more than just a mere homage to classic heavy and thrash metal. Songs like Denim & Leather, Creeping Death, Wrathchild, Powersurge reveal more than their influence upon Ultimatum, but also the soul of a great musical form. However, the downside to this platter is twofold. First, the production and mix waffles between muddy and hollow sounding like an 80's demo tape. I don't mind reliving the past, but I also want to enjoy it. Second, call his voice third rate Bon Scott attempting some death metal, but I don't think Scott Waters can sing. I found him even more grating than 'Lips' Kudlow of Anvil. Even with these reservations, Ultimatum's Lex Metalis is an awesome tribute to the greats that made heavy metal what it is today. Recommended!. Ultimatum's tribute to great metal bands of the 80's, Lex Metalis, is better than a kitschy homage: four true believers breathe life and passion into every song.